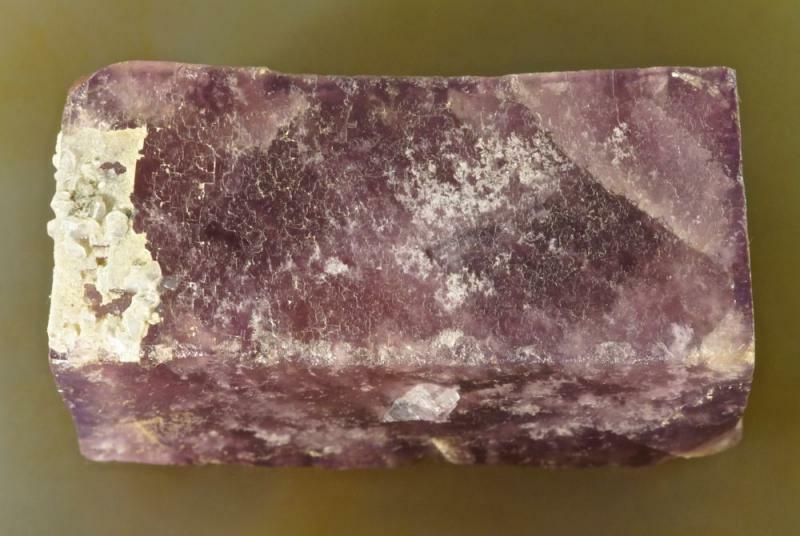 Most fluorite crystals are roughly equant, but some are markedly elongate (e.g. 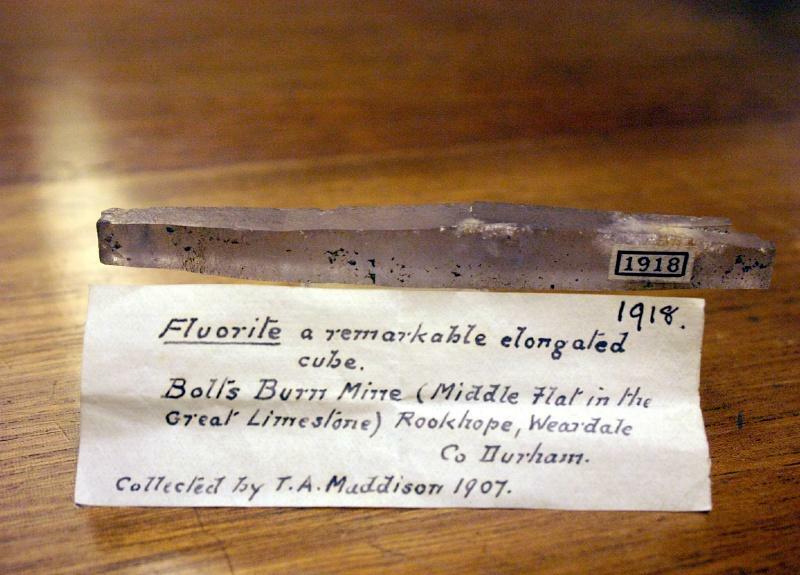 crystals from the Blackdene and Boltsburn mines, with length to width ratios from about 2 to 5) and occasionally tabular forms (e.g. crystals from the Old Town Quarry, with length to width ratios of about 0.2 to 0.25) are seen. What’s known about the causes for these unusual deviations from the typical equant form? Old Town Quarry, Newton Aycliffe, Co Durham, UK. 4 cm specimen, crystals are 3-4 mm wide. Blackdene Mine, Ireshopeburn, Weardale, Co Durham, UK. 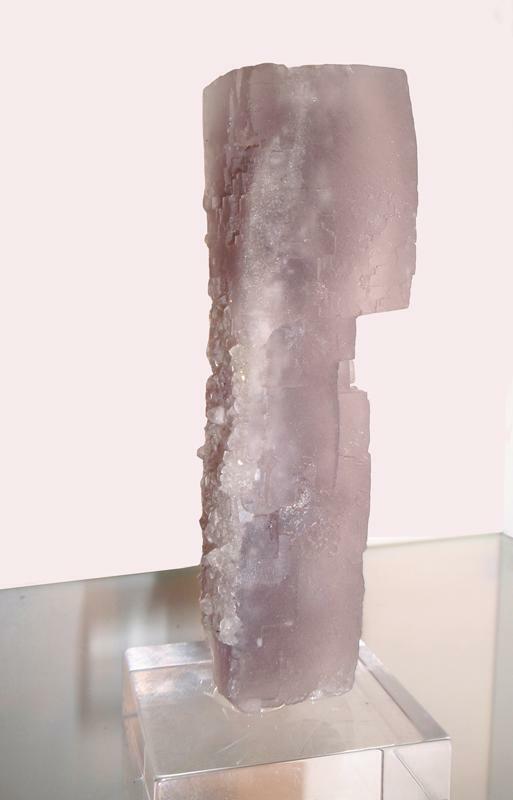 95 mm specimen with 45 mm elongate fluorite (L/W = 5). Boltsburn Mine, Weardale, Co Durham, UK. 50 mm long and 25 mm wide. Not sure what the cause is, but here's one of the most extreme examples I've ever seen - Russell collection #1918 in the Natural History Museum, London. Wow, spectacular (and thanks for the Blackdene example). How many different mines have you seen this type of habit from? There seem to be quite a few examples from both Blackdene and Boltsburn. Amazing. County Durham seems to be the source of many remarkable fluorites. What is the setting there? Mark - The North Pennines Orefield (of which Weardale is the center) is a classic Mississippi Valley-Type ore deposit, very similar to the fluorite deposits in Southern Illinois. The ore deposits are epigenetic, low temperature and form as both fracture-filling veins and horizontal metasomatic replacement deposits, which are formed within bedded limestones. For a more detailed description (with respect to specimen mineralogy) see the Jan/Feb 2013 issue of Rocks & Minerals. Ru - though Blackdene and Boltsburn are the best-known localities in Weardale for these elongate fluorites, I've seen them from other mines as well. Below is a photo of one we found at the Rogerley a couple years back. 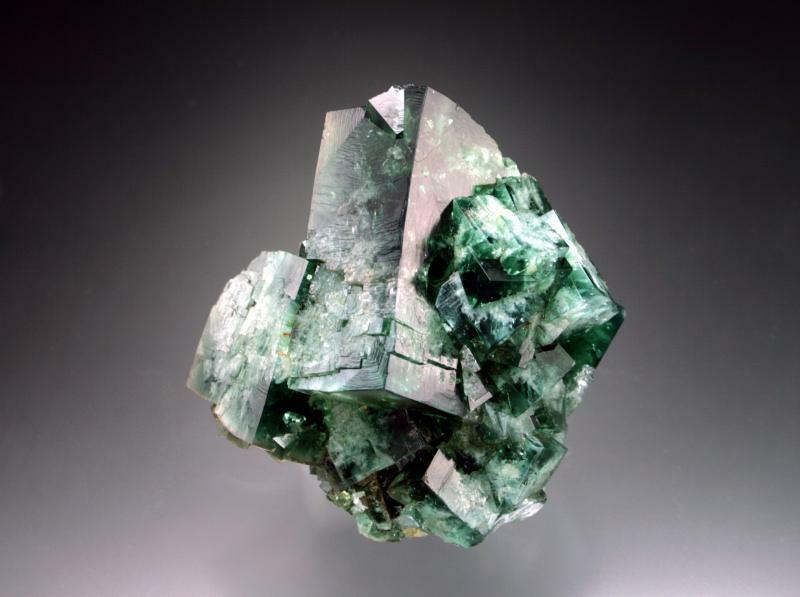 an odd, tabular fluorite crystal, with some inter-facial angles that deviate from 90 degrees. By coincidence I've just been doing some reading on the development of skeletal cuprite crystals and, ultimately, acicular ones (chalcotrichite). My understanding is that these elongated crystals develop by means of a screw dislocation in the lattice on one of the faces. The resulting "step" on that face, albeit minute, provides a site for preferential nucleation, leading to accelerated growth for that particular face and, ultimately therefore, to an "elongated cube". I also understand that an over-saturated solution favours the development of such crystals. I can thoroughly recommend Boris Kantor's "Crystal Growth and Development" published as Mineralogical Almanac, Volume 6 (2003). Many thanks, Malcolm, I'll get a copy of that. 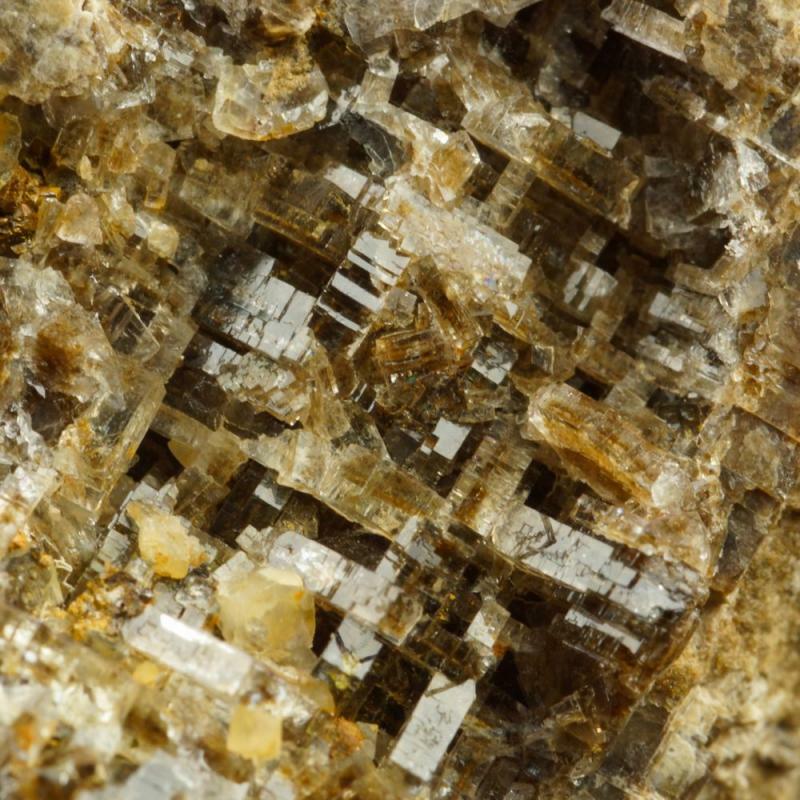 This explanation made me think of the attached elongate pyrite inclusions in a crystal of fluorite from Hawes, Yorkshire. East Flatt, Raygill Mine, Hawes, Wensleydale, Yorkshire, UK. FOV about 6 mm. Fluorite crystals to 44 mm in 75 mm group. and nice Rogerley specimen, Jesse. By coincidence I've just been doing some reading on the development of skeletal cuprite crystals and, ultimately, acicular ones (chalcopyrite). This is a well-recognized and well-studied mechanism for forming "whisker" crystals such as chalcotrichite (not chalcopyrite), pyrite, halite, etc. But this is a mechanism that operates at a sub-mm scale - whiskers are millimeters more or less long and tenths of millimeters in cross section. It would be very difficult to explain macro bars such as the fluorites of current discussion in this way - one would have to appeal to many hundreds of screw defects perpendicular to long axis, and none parallel to the other equivalent axes. Why should this be? Large bars such as these and some large pyrite bars, e.g. from the Buick Mine in Missouri, are to my thinking unexplained, especially when they occur among undistorted crystals of the same mineral! The only scheme that makes any sense to me is that crystal growth started as a whisker crystal, but this mechanism stopped (why?) after growing a VERY long whisker, and was replaced by normal growth of equal velocity on all crystal faces. This would lead to a reduction in elongation over time from, say, 20:1 to to 10:1 to 4:1 etc. If normal growth dominated, it could even lead to a crystal without discernible elongation. I wonder how one could possibly evaluate this mechanism for a given locality (especially without destroying the distorted crystals). ...This explanation made me think of the attached elongate pyrite inclusions in a crystal of fluorite from Hawes, Yorkshire. This kind of sulfide inclusion in fluorite and other minerals such as calcite is fairly common in MVT-type deposits (and probably others). My studies suggest that this is a case of balanced growth, where the host and the guest (sulfide) grow at essentially the same rate. If the inclusion grows much faster, it grows beyond the bounds of the host, and takes on its preferred crystal shape (and then the future history determines what we see). If the host grows too fast at some point, the guest gets engulfed and ceases growth. In some cases, the relative growth rates may select for orientations of the guest that are fast-growing. This suggests epitaxy, but is not - it's more a case of growth competition such as occurs in mono-mineralic associations such as quartz druses. I think this is one of those situations where our interest in unusual things distorts our perspective. 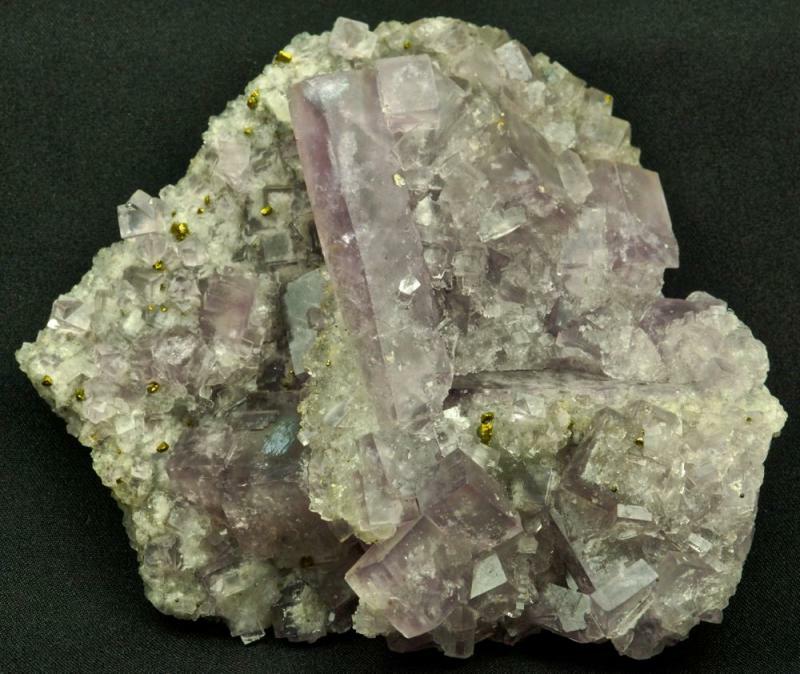 Dealers and collectors will choose and emphasize specimens like the ones Ru has illustrated - long stripes of sulfide enclosed in fluorite or calcite or quartz - but ignore (or interpret differently) hosts with a phantom of small sulfide crystals confined to one growth surface of the host mineral. 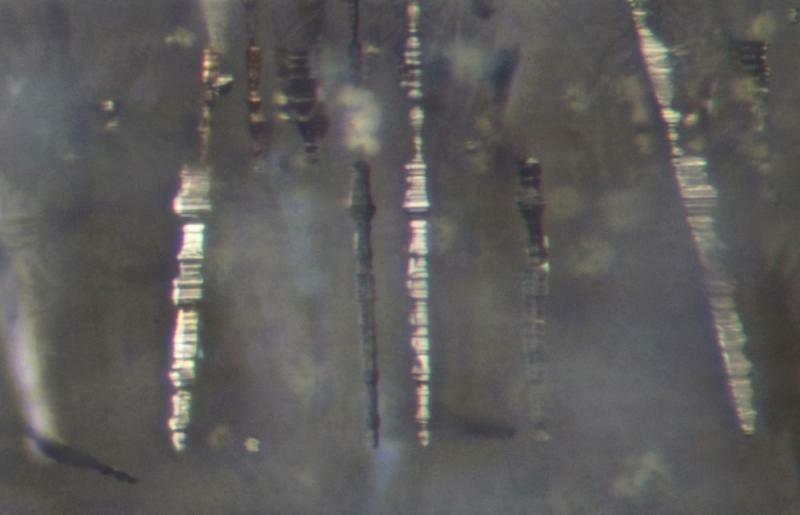 What do you make of these micro pyrite columns, Pete? 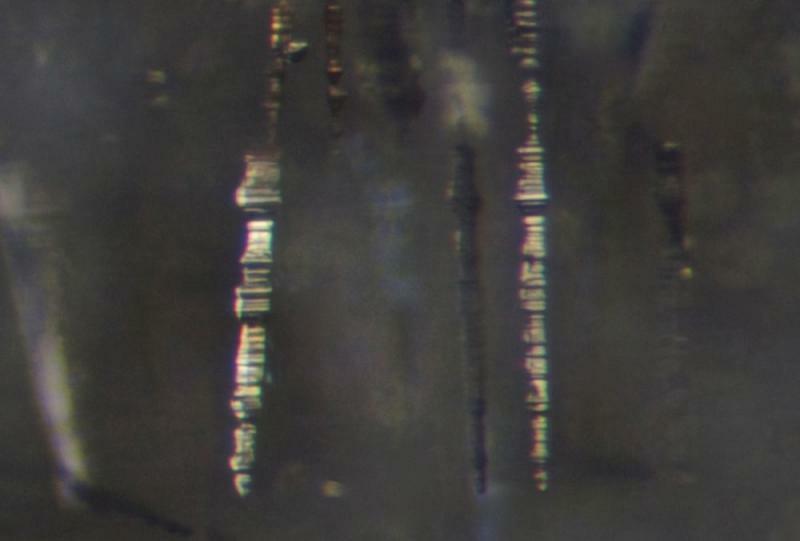 There is a "microstratigraphic" record of narrowing and widening showing the same pattern in all of the columns caught in the photos. Interesting. It would seem basic that the face of rapid growth would have unsatisfied electrical bonds making it a site for accelerated growth vs. those sites that have stable configurations. I suppose the "ledge" created by a screw dislocation, on the C axis, would result in elongated growth along that direction. But why it occurs I have no idea. Random variation or chemical causes? 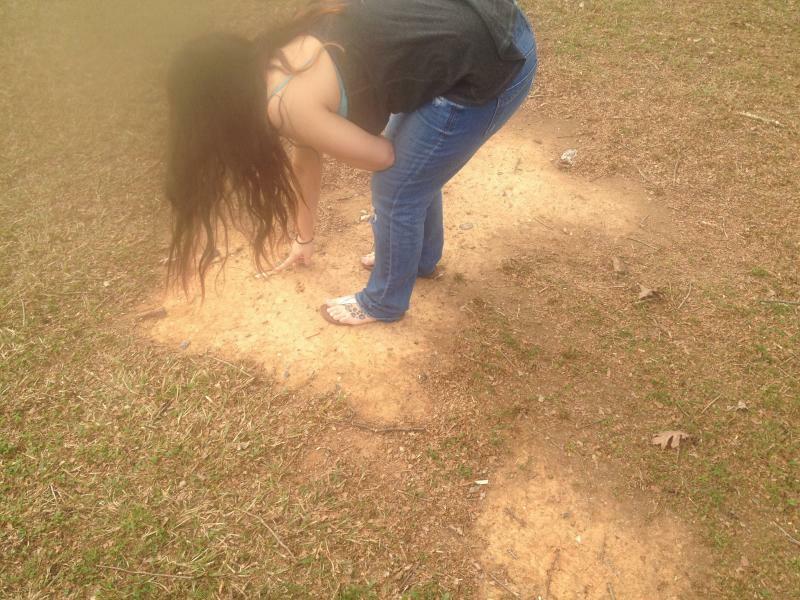 Like my mineralogy professor said "People, like crystals, grow on their imperfections". Doubt that helps but sounds good. Our messages may have crossed... but those oscillations are typical, and I presume they represent small changes in the relative growth rates of fluorite and pyrite. I don't know what the mechanism is - I will definitely not suggest annual growth rings! Perhaps an oscillation in pH or Eh? It would be fascinating to be able to put a time scale on those - are they annual, decadal, millennial? Pete is it possible that as the crystal grows it depleted the fluid it draws from and reaches a chemical state that then allows normal growth, somewhat like magma differentiation? We're having a little trouble keeping themes separate here, but i am going to answer this assuming it pertains to whisker growth rather than to competitive growth of e.g. pyrite in fluorite. It is a normal observation in laboratory experiments that whiskers grow fast and long, and then later or even simultaneously normal crystal growth thickens the whiskers over time. 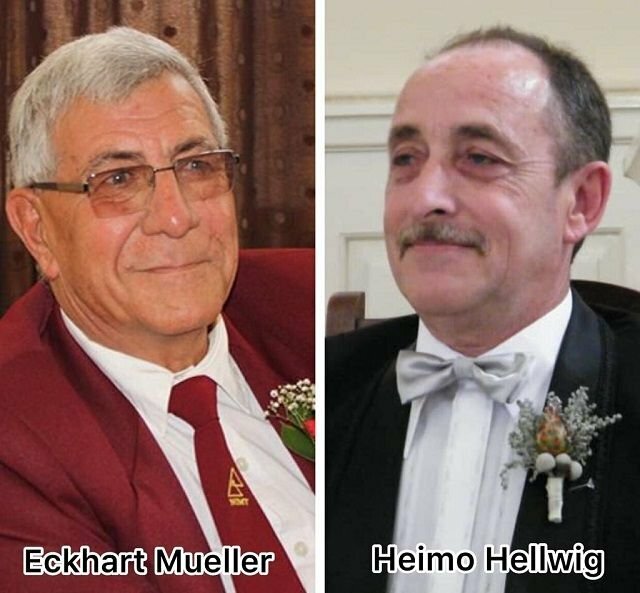 The problems is that there are at least three separate mechanisms of whisker growth, and it is not clear that all of them operate under conditions that would lead to later thickening, or even operate under typical geological conditions. 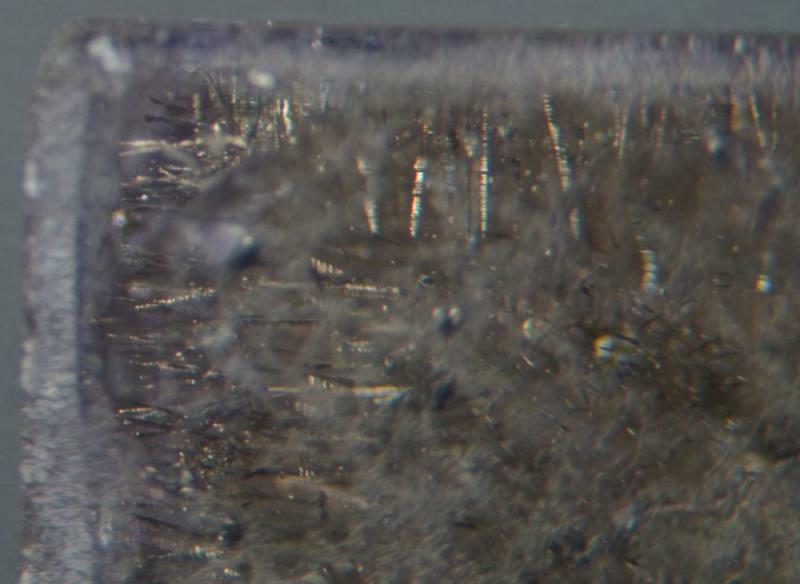 In particular, growth around screw defects is sometime suggested as a mechanism for continuing (or permitting) growth when supersaturation is too low to grow normal crystals. In this case, one would not expect thickening of the whisker unless low or declining concentrations were reversed. While there may be some ways to unlock the history of crystal growth in specific conditions, Nature runs a sloppy laboratory, and this makes understanding of details difficult at best! A senior moment - chalcotrichite indeed! I'm very interested in this theme of elongated crystals, and would like to explore it a little further. I, too, have examples of these among my Weardale fluorites, and the sometimes-cited explanation of "asymmetry in the growth environment" makes intuitive sense, but doesn't in any way explain the phenomenon. Geometrically, cubes can tesselate perfectly, to form a "bar" of any size or shape with three axes of symmetry still at 90 degrees to one another. 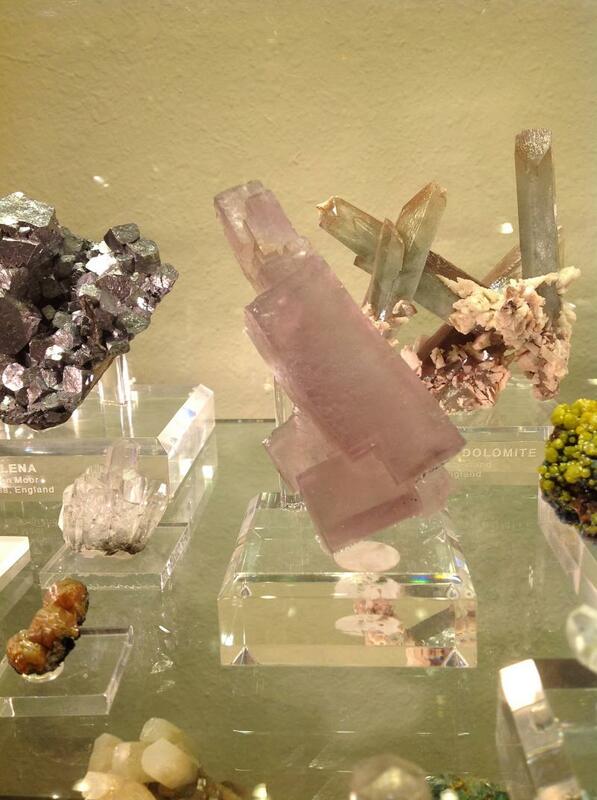 Should we perhaps think of these elongated fluorite crystals as a "stack" of cubes? Also, Kantor (in the reference I cited in my earlier posting) talks about what he calls the "corner octahedron" model for development of skeletal crystals in the isometric system. I won't begin to attempt an explanation of that here, but it seemed to me not a million miles away from the idea of "stacked cubes", but with the stacking very much ordered by the symmetry requirements of the mineral concerned. A very quick picture of another elongated Blackdene fluorite with quartz on the LH side. Never common although for some reason, Blackdene seemed to produce them. Now off to the airport to get away from the cold here in the UK for a few days.